Two branches in the service and all I have to show for it is an attitude?!! This page isn't exactly one I really wanted to write or keep at first. I was a bit hesitant on even having it on my website, but people who know me would ask why I didn't say anything about the military. My last command wasn't worth bragging about, to be honest. I don't dislike the Corps, in general, just that particular duty station. Most of the staff at my former command didn't have a clue. It seemed they were more concerned with nit picking than the crimes that were going on right under their noses. I will say that, but I'm not going to sit here and destroy other people's feelings or reputation, personally. I'm not a posh, right wing, Republican or a Pentecostal, so I don't have that right. One regret during my time in the Navy and the Marine Corps, was not getting enough pictures of me in uniform. In the picture above is me with my friend John. 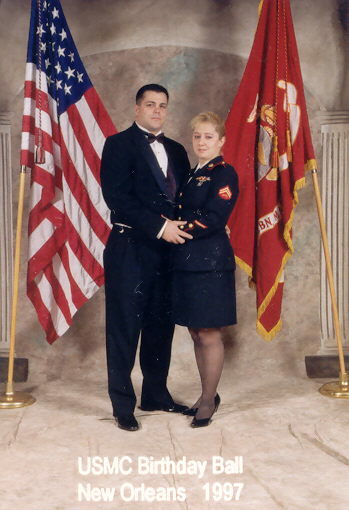 This is one of the seven Marine Corps Birthday Balls I attended. I think he had more fun there than I did. A year prior, I met the Commandant (at the time), General Krulak, and was given a coin from him. As a matter of fact, I don't recall any other enlisted person getting a coin from him, besides myself, that night. I would have heard about it if so, and yes, a lot of sycophants there were a bit on the envious side. I worked for Supply and Admin. Supply in the Navy, admin in the Marines. At my last duty station, I worked for Tuition Assistance and Prior Service Recruiting. After a couple years, I became quite popular with the Recruiters and Career Planners throughout the US. I was the one who would be calling or emailing them at the beginning of the month asking them for their quotas. I managed to go to Europe in the Navy, but in the Corps, I never left the Continental US. The places I have been to in the Corps were: Camp LeJeune, NC Newport News, VA, Bridgeport, CA, 29 Palms CA, Mayport, FL, New Orleans, LA, and Kansas City, MO. "The Marines I have seen around the world have the cleanest bodies, the filthiest minds, the highest morale, and the lowest morals of any group of animals I have ever seen. Thank God for the United States Marine Corps!" - Eleanor Roosevelt, First Lady of the United States, 1945.